This year’s biggest culinary trend on cruise lines is not about what we’re eating, but when we’re eating. The flexible dining revolution has taken hold, forever changing the way hungry cruise travelers think about dinner. Since NCL introduced the concept of dining where you want, when you want, Princess and Holland America have followed suit with hybrid versions—passengers can choose to eat at an assigned table at a predetermined time, or they can sign up for a flexible dining plan and simply show up in the dining room within restaurant open hours. This year, holdouts Royal Caribbean and Carnival are testing similar half-and-half programs on a few ships; Royal Caribbean has even announced plans to roll its new hybrid out fleetwide. Still, this trend toward anytime dining has divided the cruising public, causing plenty of debate and even some hostility. Traditional dining stalwarts groan and gripe about long waits and diminished service, while flexible enthusiasts celebrate the end of dining too early or too late (not to mention a new escape route from irritating dining companions). The hullabaloo garnered by these simple restructurings just goes to show how much food is an integral part of the cruise experience. Cruise lines may have moved past the days of constant gorging at all-you-can-eat buffets and midnight smorgasbords, but many would-be passengers take dining options, quality, and timing into account when choosing their next cruise. This focus on food ensures the cruise lines are constantly coming up with new restaurants, culinary events and menu options to keep their customers happy … and well fed. From onboard tandoor ovens to cooking classes in Slovenia, here’s what’s cooking this year in onboard cuisine. The “trans fat is bad” revolution is now firmly entrenched on cruise ships. Crystal Cruises was the first to overhaul passenger menus to rid all dishes of the type of fat that results in higher levels of bad cholesterol (and a higher risk of coronary heart disease). Crystal’s move has benefited more than just its passengers; crew galleys, too, have gone trans-fat-free, with a greater emphasis on fresh fruits and vegetables, and whole grains. Crystal wasn’t the only cruise line to ban trans fats. Royal Caribbean ships all feature trans-fat-free menus. A trans-fat-free cooking policy has also been implemented on two of % 2541953 || [MSC Cruises’ %] ships: MSC Lirica and MSC Opera. And Carnival Cruise Lines, which began removing trans fats from cooking oils and salad dressings in 2005, took that program to the next level in 2007, finding trans-fat-free alternatives for pastries, buns, certain cheeses and dessert icings (cake mixes were already trans-fat-free). Even before the trans fat revolution, healthful food had become and still is so important to cruise lines that new ships (and those older vessels undergoing refurbishments) feature light-fare cafes. Of particular note are the efforts of Celebrity; each of its Millennium-class ships has cafeteria-style spa eateries and its Century, which underwent a massive re-do in 2006, unveiled a stand-alone spa restaurant. Even more comprehensive will be its new Solstice. That ship, due out in fall 2008, will feature spa cabins; in addition to a package of spa facilities, passengers will receive exclusive entry into a more formal version of the AquaSpa Cafe concept. Costa gets credit, though, for fueling the spa cabin innovation; its Samsara Spas on its newest vessels—including Costa Concordia and Costa Serena—include formal spa restaurants, accessible to spa cabin residents. The concept is beginning to take hold in the industry; both Holland America, with Eurodam, and Celebrity, with Celebrity Solstice, have introduced some elements on new ships. Most cruise lines incorporate healthful menu choices on all menus; Cunard’s Queen Mary 2’s Canyon Ranch choices are the best we’ve tried at sea. Royal Caribbean’s Vitality program, introduced on Liberty of the Seas in 2007, not only includes healthy menu options (think natural ingredients and freshly prepared meals) but also better-for-you snacks, such as energy bars, protein shakes and green tea drinks. The alternative restaurant trend continues to evolve onboard and is becoming more interesting. Carnival’s variously named supper clubs, present on newer ships in the fleet; Celebrity Century’s Murano (with its sleek 1940’s ambience, and fantastic wine and food pairing menus); and the Crown Grill (a seafood and steak joint with an open kitchen) on both Crown Princess and Emerald Princess are among the most glamorous eateries, while Johnny Rockets on Royal Caribbean is the perennial winner of “most popular” for casual dining. Ethnic food is also gaining a foothold in onboard dining—and we’re not just talking about the usual French and Italian onboard restaurants. Holland America’s new Eurodam sports a pan-Asian restaurant called Tamarind, with entrees like Shrimp Szechuan with Thai Basil and Red Curry Coconut Chicken. Carnival now has tandoor ovens on Carnival Freedom and Carnival Splendor, and offers a lunchtime Indian grill. Splendor, Freedom and Carnival Liberty also feature a Mongolian Wok station with made-to-order stir-fry. However, the long-time title holder in this category must be NCL’s Teppanyaki—for putting on an exciting show while cooking yummy Japanese food. Sushi bars have become almost ubiquitous on cruise lines ranging from Carnival to Crystal. Celebrity Century has that line’s first ever designated sushi bar (adjacent to an Asian-themed seating area). Crystal Serenity offers the industry’s most upscale sushi – world class master chef Nobu Matsuhisa, who launched Silk Road and The Sushi Bar there, will now expand the concept to Crystal Symphony. The Lido buffet has gotten a makeover. At night, many cruise lines transform ships’ buffet venues into more glamorous—yet still relatively casual—dining destinations. Oceania Cruises’ Spanish-influenced Tapas on the Terrace is a favorite, with its small tastes, comprehensive salad bar and freshly made Sangria being highlights; you can eat on the outside deck in good weather. On P&O’s Artemis, the Conservatory Grill features candlelit tables and great steaks. Queen Mary 2’s Asian-fusion Lotus, part of its King’s Grill buffet, was fantastic, bar none—but it was tough to get a table! Harder in fact to find a spot there than at the hip and trendy Todd English. And speaking of buffets, the midnight buffet is on its way out. Celebrity is one line among many that has sounded the death knell for its once-per-cruise gala midnight buffet. Instead, passengers with the late-night munchies can head to the Cova Cafe coffee shops, which now offer “after-theater menus” from 11 p.m. to close. Menu items include tartlets, canapÃ©s, artisan cheeses and petit fours. Late-night dining on other lines include NCL’s 24-hour restaurant, which serves comfort food like mac ‘n cheese and tomato soup round the clock, and Princess’ evening bistro from 11 p.m. to 4 a.m. in the Horizon Court, which offers an array of choices from sandwiches to salads, pastas and desserts. If midnight gorging is out, brunch is suddenly in. Celebrity now has a once-per-cruise gala brunch—complete with photo-worthy fruit and vegetable carvings. Brunch includes a little bit of everything, from made-to-order smoothies and eggs on the breakfast end to more lunch-worthy pizza, paninis and wraps. Also on the brunch bandwagon is Disney Cruise Line’s adults-only restaurant, Palo, which offers a champagne brunch on sea days. Princess offers a champagne brunch as part of its in-room dining program, but passengers must have a balcony to partake (and pay an extra fee). Cruising’s not just about eating—it’s about learning to concoct the stuff as well. Holland America’s really carving out a niche on this one; its Culinary Arts Center has a television-ready demo kitchen and ships offer small groups hands-on lessons that are fun and tasty. Regent Seven Seas Cruises, too, takes cooking seriously and on some cruises offers lectures and demos by its partner, Le Cordon Bleu. These days, culinary education doesn’t stop with onboard demos. Cruise lines are recognizing the appeal of food- and wine-based shore tours—a tastier and more in-depth option to the traditional bus tour. Oceania has teamed up with Food and Wine Trails to offer tours that give a taste of local life, as well as a taste of local food and wine. Azamara introduced new culinary excursions to its 2008 Europe cruises, including a tour of Slovenian salt plants, olive farms and wine cellars, and a “pasta party” in Civitavecchia, Italy (the port for Rome), complete with a pasta-making workshop. If you’re hooked on the cult of celebrity chefs, turn off the Food Channel and start packing your bags. 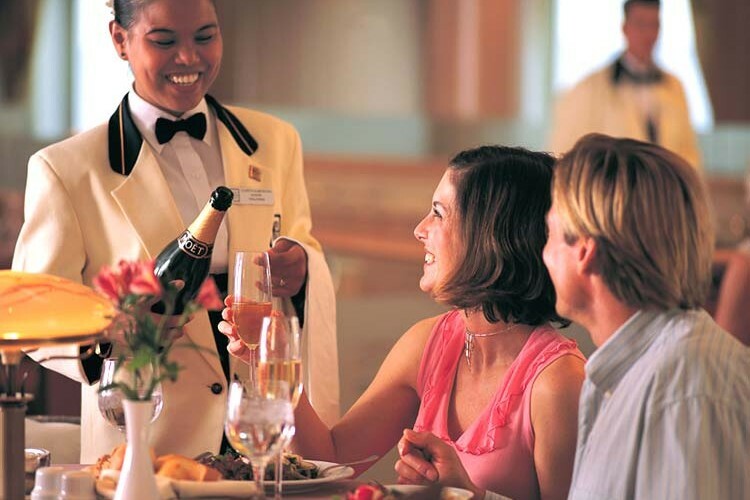 Several celebrity chefs now have onboard restaurants or serve as culinary advisors to the cruise lines. Boston-based Todd English of Olives fame has outposts on Queen Mary 2 and Queen Victoria. British TV fans will recognize Pierre White, star of ITV’s “Hell’s Kitchen,” who has a restaurant on P&O’s Ventura with another to come on Oriana. Public television cooking star Jacques Pepin is Oceania’s Executive Culinary Director, making his mark on all the ship’s restaurants, and Nobuyuki “Nobu” Matsuhisa, a classically trained sushi chef with an empire of eateries around the world, is the mastermind behind Crystal’s Silk Road and Sushi Bar restaurants. Will Rachael Ray and Emeril be next? Carnival’s wine program may have folded, but wine aficionados have plenty of choices these days for viticulture at sea. Wine bars can be found on NCL’s, Royal Caribbean’s and Princess’ newest ships for a little onboard imbibing. Cruise West offers two California wine country itineraries, with visits to Napa and Sonoma wineries, and once a year, Celebrity turns a Vancouver-to-San Diego repositioning cruise into a wine lover’s cruise with vineyard visits, wine appreciation seminars and lectures by wine experts. Crystal is also banking on its guests being wine aficionados—its ultimate wine experience dinners on select voyages feature rare vintages and a $1,300 per person price tag. Other beverage trends include the rising popularity of tea as a gourmet drink; Cunard has introduced Wedgwood tea service on its ships—featuring 23 flavors that range from traditional to contemporary. Coffee bars are now an expected feature, particularly on the big ships. Beyond the specialty brews (priced a la carte), they offer pastries and savory snacks. Our favorite? Crown Princess’ International Cafe features a bakery with on-the-spot ovens … and the smell is delectable. Smoothies and milkshakes are also finding their niche spot onboard. You can find these breakfast-meets-dessert concoctions on Royal Caribbean and Oceania.